Regardless of their lives, the brave soldiers of the country, protect the border, by being stationed on the border, so that we can live comfortably and live our lives without fear. But have you ever thought that even after a martyr is martyred, he should be on the border for the defense of his country and fulfilling his duty with full commitment. It is uncomfortable and absurd to hear this. But today we are telling you the story of an Indian soldier's courageous soldier in this article, which is unbelievable even after being genuine. On the Indo-China border of Sikkim, the fame of a martyr hero who protected the country with full dedication and duty in his life but after death, his soul is still doing the security of the border with great speed. The surprise thing is that for this, he gets salaries and it is also promoted, and in the memory of this martyr soldier, a temple has also been built which has become the center of faith for millions of people. Its confirmation is that many soldiers of the Indian Army and the Chinese army have done it. There is no place called superstition in the cautious and very sensitive departments like the Indian Police or the Army, but it's a wonder story. The story of Baba Harbhajan Singh - Baba Harbhajan Singh, Indian Army soldier. In which the confidence of the Indian army is also hinged, and this story is unbelievable even after being real. 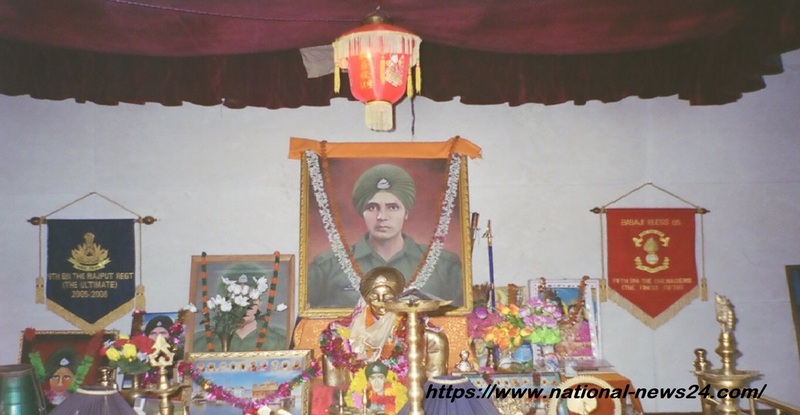 This mysterious military Baba Harbhajan Singh was born on August 30, 1946 in Sadarana village of Punjab, which is now in Pakistan. Baba Harbhajan Singh received his early education from a school in the village. At the same time, in March, 1955, he joined D.V. High school ', matriculation from the bar. Harbhajan Singh was admitted to the rank of Sepoy in the Punjab Regiment of the Indian Army on February 9, 1966. After this he was posted in East Sikkim with the 23rd Punjab Regiment in 1968. Harbhajan Singh also made several important contributions to his unit in the Indo-Pak war. It was said that on October 4, 1968, when the Saini Harbhajan Singh was carrying a mule cemetery. At the same time, his leg slipped near his native Sikkim's Nathu La passes and he died after falling into a deep ditch. Let us tell you that the water flow of the Bay was so fast that it took away its body and took it away. On the other hand, when Baba Harbhajan Singh did not return to his camp for a few days, the Indian army declared Baba Harbhajan Singh as a hate crime. It is believed that, that was the day on which Baba Harbhajan Singh's soul knocked on the Indian Army, that night the soul of Baba Harbhajan Singh came in the dream of his fellow military Pritam Singh. After coming into the dream Baba Harbhajan Singh gave the information to the soldier about the entire incident with him. At the same time, the information about the location of his dead body was given to his fellow soldier in the dream. On the next day, when the soldier told the other soldiers about the soul of Baba Harbhajan Singh, some soldiers in this case denied it, while some soldiers decided to go to that place, relying the matter of the soldier. .
Let me tell you that as soon as the people reached that place, they found Baba Harbhajan Singh's dead body in the same place and in the same situation that Harbhajan Singh's soul had said in the dream of his fellow soldier. Seeing that, the lands under the feet of those soldiers were slaughtered. Not only that, the soul of Baba Harbhajan Singh told about his broken bone in the dream of his fellow soldier. That too proved 100 percent correct. Yes, when the post-mortem report came, it was proved that Baba Harbhajan Singh's right leg has broken. This thing was quite awkward and weird, a soldier who died, and then his soul came into the dream of any other soldier and told about himself, this was largely unbelievable but everything proved to be true of Baba Harbhajan Singh . Let us tell you that Baba Harbhajan Singh's soul came again in the dream of that same soldier and he came to his dream and said that even today he is working in his work and even today he is performing his duty with full integrity and honesty. With this, Baba Harbhajan Singh also expressed his desire to be made his tomb. Considering the desire of Baba Harbhajan Singh, a Samadhi was created. Indian Army built his Samadhi in the middle of the Jalepala Pass and Nathula Pass in Gangtok, the capital of Sikkim in the year 1982. The faith of lakhs of people is attached to Baba Harbhajan Singh's temple situated at an altitude of about 13 thousand feet. People come from far away to come to this temple. There is a photograph of Baba Harbhajan Singh and his shoes and the rest of the luggage in this temple. Baba Harbhajan Singh's samadhi is believed to be that here if any bottle of water is kept for 21 days then such a kind of miraculous properties are produced in that water. The use of which can be rid of any serious illness. The guard of the temple of Baba makes the army of Indian Army. And then polish them and their shoes. Clean their uniforms and even bedding their beds. According to the soldiers stationed there, there is a sludge on the cleaned shoes and their beds are seen also. With the arrival of Baba Harbhajan Singh on the outskirts, the soldiers of their own country are confident, and simultaneously China's soldiers also believe this and are afraid that Baba is on the watch for the border guarding. It is said that after death, Baba Harbhajan Singh is giving information about the activities of the Chinese army around Nathula in the dream of his companions, which is proved as always as usual. Let us tell you that the Chinese soldiers also saw Baba Harbhajan Singh's soul several times riding on a white horse and patrolling the border. At the same time, when the matter began to grow further, Chinese soldiers talked to Indian soldiers about this. After that Indian soldiers had said that no soldiers guard at the border at that time, but the next day Baba Harbhajan Singh's soul told his friend in a dream that his soul sitting on horseback and protecting the border and protecting the border . On the basis of the above facts, Baba Harbhajan Singh has been kept in service of the Indian Army just like a soldier after his death. He is still performing his duty in the Indian Army with full sincerity and integrity. And according to the rules of the army, they are also promoted. Baba Harbhajan Singh is also called the hero of Nathu La. At present, the soldiers of India and China rely on Baba Harbhajan Singh's name, hence, every flag meeting of the two countries is also named after a chair named Baba Harbhajan Singh. So that Baba Harbhajan Singh can attend every meeting. Apart from this, Indian soldiers also say that Baba Harbhajan Singh warns him about the attacks from China. Even if Indian soldiers do not like any step taken by Chinese soldiers, then the spirit of Harbhajan Singh also tells the Chinese soldiers about the resentment of Indian soldiers. So that peace can be compromised in collaboration with each other. However, whether you rely on such activities of Shaheed Saini Harbhajan Singh or not, or call it superstitions. But Indian soldiers are still confident of Baba Harbhajan Singh's presence. Along with this, many people's faith is associated with Baba Harbhajan Singh's temple. At present, our team honors the heroic sons like Baba Harbhajan Singh, who is still ready to serve his country even after the martyrdom. Note: Baba Harbhajan Singh has written these articles only with the purpose of giving information. You believe in it or superstition depends on you.